“The set-list tonight is refreshingly varied and the passionate crowd/band interactions help to make this relatively large conference room feel more like an intimate pub setting”. 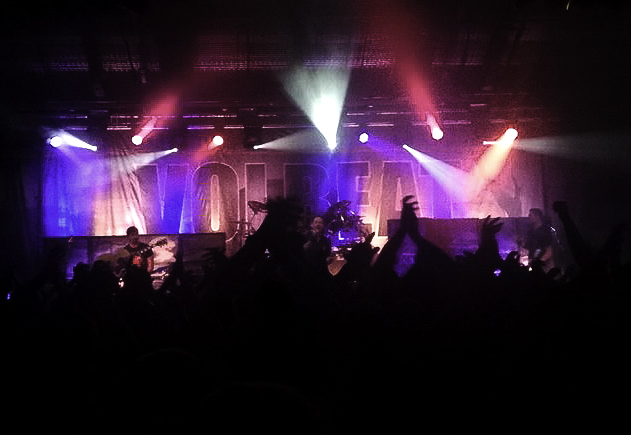 Having already established themselves as one of the hottest acts in the European rock scene, Volbeat (9), while still managing to attract a fair sized crowd, haven’t made quite the same impact on the UK yet. On the continent, they’re a festival-headline size band, yet on these isles, they fail to pack out a venue the size of Portsmouth’s Pyramid Centre. This is through no fault of the band’s, as they give the same spirited performance regardless of audience size, but is probably more to do with the contrasting taste between the UK scene and that on the continent currently. That said, the fans they have made over here are a passionate bunch, which becomes obvious when the band make their entrance and are greeted with a considerable reception of applause and some enthused screaming. Wasting no time, the Danish four piece launch into the bizzarely titled ‘Hallelujah Goat’, frontman Michael Poulsen’s Elvis-like vocals, as always, absolutely spot on and his on-stage antics tireless. The set-list tonight is refreshingly varied and the passionate crowd/band interactions help to make this relatively large conference room feel more like an intimate pub setting. At one stage during their set, Poulsen spots a young fan on a parent’s shoulders, he then proceeds to crowdsurf over to the child to present him with a Volbeat T-shirt. It’s little touches like this which really help an audience connect with a band, and tonight Volbeat give a masterclass in that art. It’s telling that during a brief run through of ‘Ring of Fire’ (as an introduction to the Johnny Cash inspired ‘Sad Man’s Tongue’), the band cease playing completely, but the audience carry the song on as one. Not many bands could pull this off. Following this, the songs come thick and fast, the epic ‘Dead but Rising’ from their most recent album Outlaw Gentlemen and Shady Ladies; a furious versions of ‘Evelyn’ featuring a guest appearance from Napalm Death‘s Barney Greenway and of course, the outright fun of their take on ‘I Only Wanna Be With You. Throughout the mammoth 17 song set, the Rockabilly-Metal mob keep the same level of energy up, right until closing number ‘Still Counting’. This is a band on absolute top form and the recent addition of Rob Caggiano (previously of Anthrax) on guitar, has solidified them further as a unit. 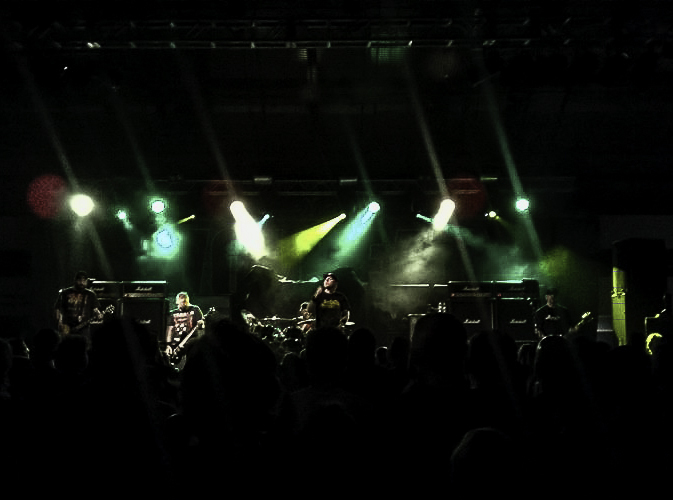 If Volbeat continue to perform in such a way, eventually the rest of the UK scene will have to listen up and take notice. Surely it’s only a matter of time until they achieve the same level of success over here, as they have on mainland Europe?